Having done much reading and research I decided to build a phase converter, of the rotary type. The problem I have is that when I opened the terminal box for the motor I have to hand, it didn’t look like I was expecting. I.e, not like the pictures or diagrams you see online. Even the numbering isn’t what seems to be the norm. It is a 2 speed which maybe the reason. I’d like to wire it up to run in the star position giving the higher kw out put. This is only a temporary for the build so that I can get my new mill operational. I’ll try attaching a picture. Given the numbering of the wires, I suspect A1,B1 and C1 to be the Star point. Then A2/A3 are the tap and end of one ine winding...ergo to change the speed it would be a matter of joining A2/A3 together....etc. Do you have a foto of the motor data plate? Hopefully picture of motor plate is below. First of all, look inside the lid that covers the terminals for a wirong diagram! Can you take a better (larger) pic of the motor plate, as that one is too small, and when enlarged, too blurred to make out the ratings. As John says, one would normally expect to find, on a six wire three phase motor, A1 B1 abd C1, and A2 B2 and C2, here we seem to have A2 B2 and C2, and A3 B3 and C3. Odd! It "looks" like A, B and C are the windings, with the ends marked 2&3 instead of the usual 1 & 2. 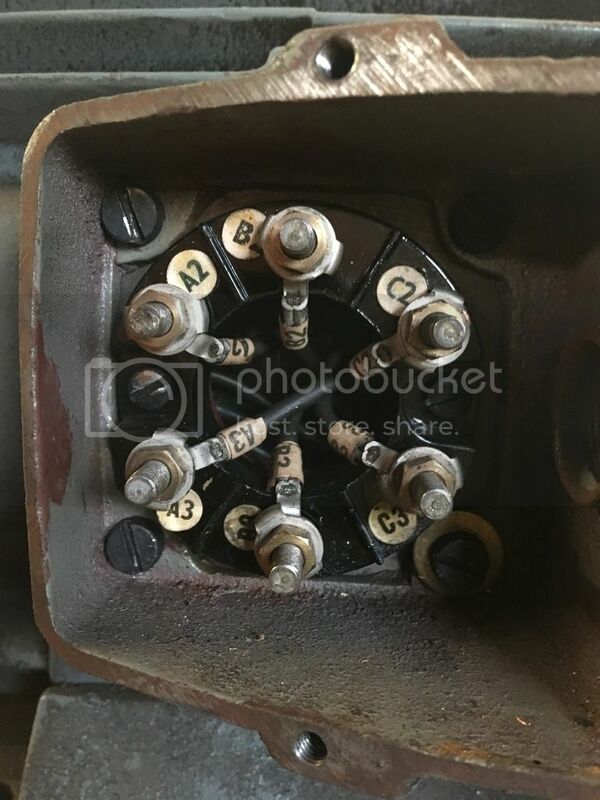 This does indicate (in Brook motors anyway) a 2 speed motor, the connections are as follows, for low speed, connect the lines (incoming three phase) to A3, B3 and C3. for high speed link A3 B3 and C3 together, and put the incoming 3 phase supply to C2 B2 and A2. A3,B3 and C3 are the Delta points, and A2 B2 and C2 are the centre taps for each winding. If you are using this as a slave motor try it in both speeds and see which gives you the nearest to equall voltages on all three generated phases. The motor is wired in Delta, and cannot easily be changed to star connections because the ends of the coils are not all present at the terminal box, but you want it in delta for 240v operation anyway? More info needed! Let’s se if this works better! Ultimately I plan to use the 2 speed motor in my Harrison. But for the moment it is spare so I’m using to get a phase converter figured out to use on my mill. The 2 speed motor is 5hp at 2800rpm, my mill is also 5hp. So if I can get it running well I should hopefully be in the ballpark for a phase converter for the mill. At a later date I’ll acquire a motor for use with the converter to make it in to a rotary. Thats much better!, according to my "Brooks" book, if you are using a "pilot" motor, it should be star connected, so you couldn't use this motor as a pilot for a rotary converter, BUT there are several different ways of making artifical three phase systems, and I only have the Brooks book version in front of me, and I am away in London till Friday! I have other references to check up, and I will get back on this, unless you can sort it in the meantime. You could use this motor in a machine on an artificial three phase system, so all is not lost. I will do some research. I am lucky, my three phase comes straight out the meters!